“The Small Waterfalls at Tivoli” (“Die kleinen Wasserfälle bei Tivoli”, Link title); “Arcadian landscape with waterfall” (“Arcadisch landschap met waterval”, Rijksmuseum title), 1744, published by Johann Friedrich Frauenholz (aka Jean Frederic Frauenholz) (1758–1822) in Nuremberg. 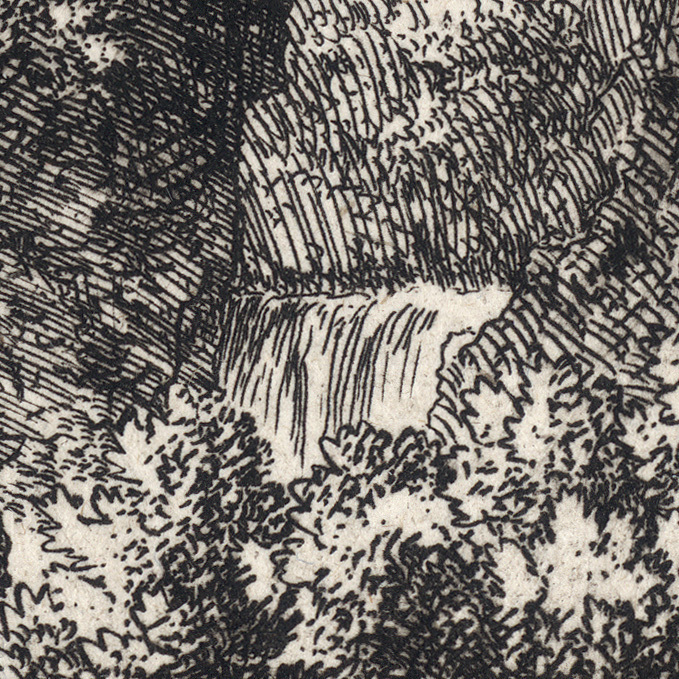 Etching on laid paper with small margins around the plate mark, backed with a support sheet. 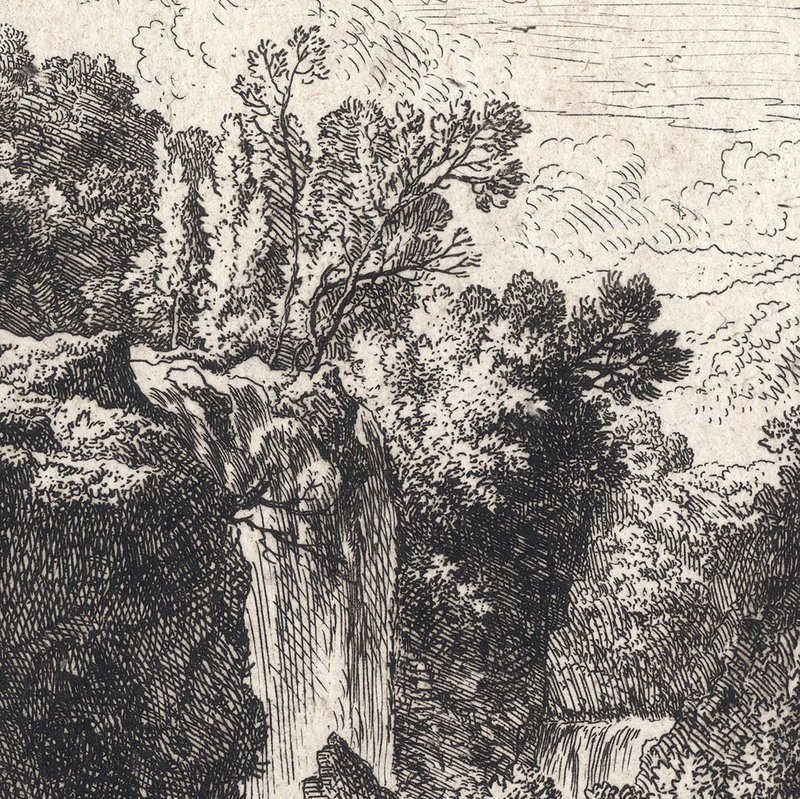 Signed and dated in the plate at upper right: “Dietricy 1744”. State iii (of iii) with the Zingg number, “45”, erased from the upper-left corner. Linck 153-III (III) (JF Linck 1846, “'Monographie der von C. W. E. Dietrich radierten, geschabten und in Holz geschnittenen malerischen Vorstellungen”, Berlin, pp. 251–52, cat.nr. 153); see also the description of this print held by the Rijksmuseum: http://hdl.handle.net/10934/RM0001.COLLECT.105713. 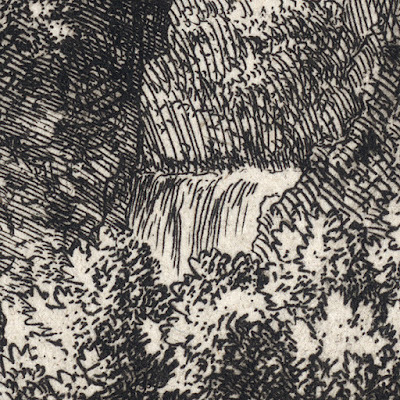 Condition: richly inked impression with small margins and backed with a support sheet of archival (millennium quality) washi paper. 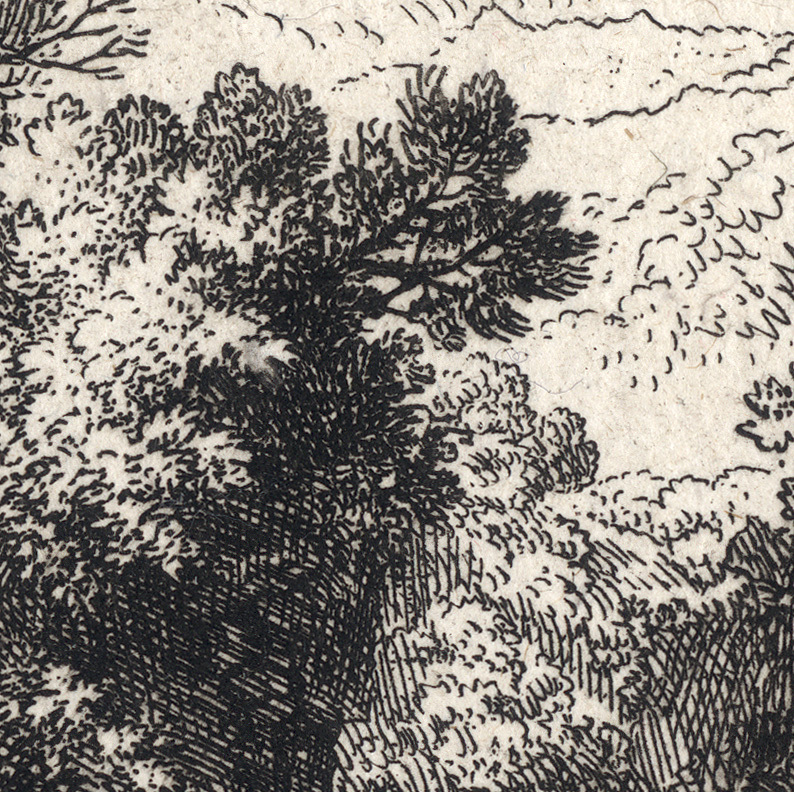 The upper left corner margin is restored otherwise the sheet is in a good condition with minor signs of age toning and handling. 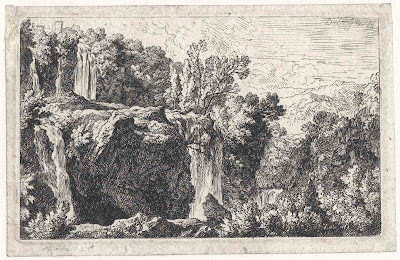 I am selling this small but exquisitely rendered etching of the waterfalls and cascades at Tivoli (Italy) for the total cost of AU$160 (currently US$117.09/EUR101.98/GBP91.58 at the time of this listing) including postage and handling to anywhere in the world. If you are interested in purchasing this remarkable nature study showing the effect of raking light on foliage, rocks and water, please contact me (oz_jim@printsandprinciples.com) and I will send you a PayPal invoice to make the payment easy. Dietricy was a bit of an artistic chameleon in the sense that he had the gift to mimic other artists’ styles. 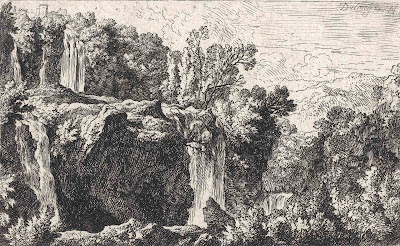 This ability, however, did not mean that his approach to image making was rinsed clean of showing personal stylistic traits. 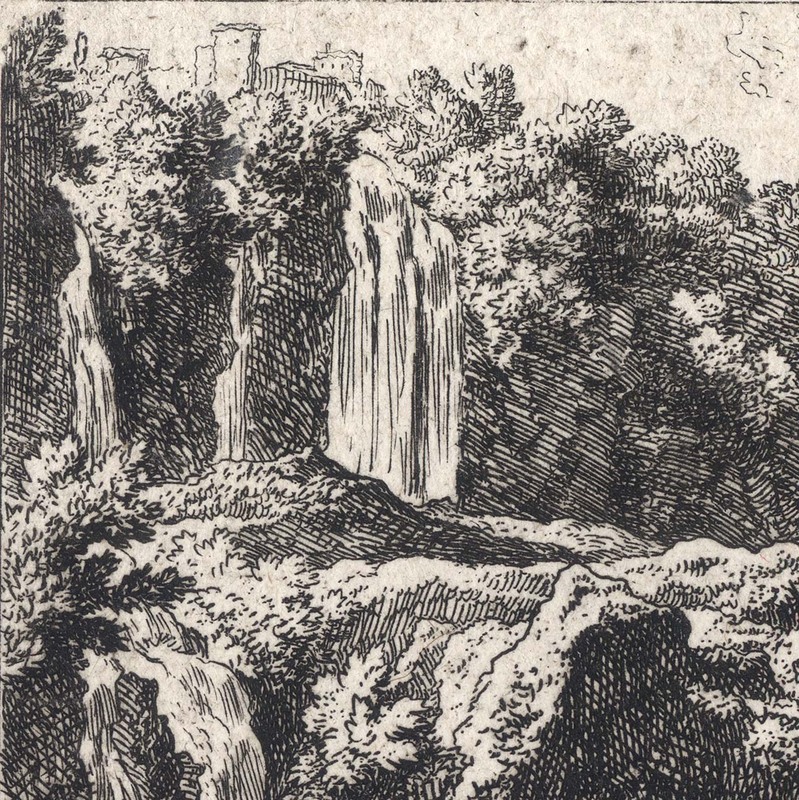 For example, this very beautiful nature study of the waterfalls and cascades at Tivoli is a fine example of his very insightful and somewhat unique approach to portraying spatial depth. 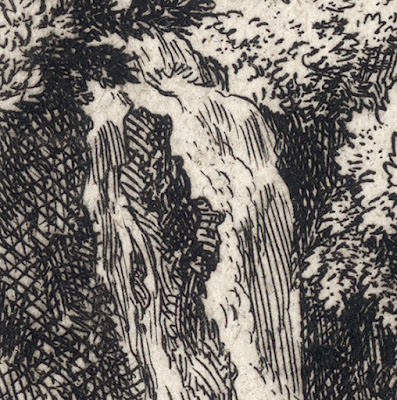 In one sense, Dietricy uses the traditional approach for showing spatial depth by making the foreground waterfalls slightly darker than those further away and employs an increasing amount of white space around each line to suggest an even greater lightening of tone into the far distance. There is, however, another device that Dietricy employs to portray depth and this, I see, as being his personal stylistic hallmark: Dietricy uses a transition from comparatively small, multi-directional cross-hatched strokes to render forms in the foreground to parallel aligned strokes in the middle distance and finally to almost horizontal strokes designed to portray distant mountains and sky.